Something rad is happening downtown. Think of it as a mini (but totally epic) contemporary renaissance. Come April 2, an interactive visual extravaganza will span the breadth of downtown, igniting a lively environment where questioning is fostered, participation is encouraged, and thought is sparked. “It’s about being vested in the community, Spokane, and supporting art and expression,” says Jillian Foster, a major partner in the Transcendence Project, a sweeping collaborative initiative to electrify Spokane. For the event, local artists have been paired with nonprofit organizations to form a set of 11 dynamic super teams. The objective? To provide a artsy vessel through which a nonprofits’ mission and identity is explored through art. The interactive installations will be housed in donated spaces across downtown Spokane. Participating artists will construct, or facilitate, a hands-on representation of what their nonprofit partner stands for, illuminating the beauty behind the vision. The creative manifestos currently range from temporary installations to interpretive performances. “This is just another way of exploring new artistic practices, as well as a revitalization and highlighting of what these organizations do for the community,” says Naaman Cordova-Muenzberg, a partner and participant. Don’t pass it off as a hippie-fest. It’s way better. Nina Chalard, who’s with the Youth Sustainability Council (one of the participating nonprofits), says that a main goal“is working to create accessible neighborhood gathering places where residents can socialize, share their ideas and work together to address important community-sustainability issues.” Here’s a look. Main Street Warehouse, 15 W. Main Ave. | Sculptor Tessa Swaboda is working with Catholic Charities’ Childbirth and Parenting Alone program. She’s going to put all Mother’s Day cards to shame, building — as a monument to motherhood — a 23-foot tree with a blown-glass uterus. New Madison Apartments, 1031 W. First Ave. | An art team calling themselves Boys Who Like Butterflies is presenting a three-part interactive exhibit focusing on the personal effects of gender and sexual violence. “We wanted to evoke hope in remembrance of a time when there wasn’t dirty laundry,” says group leader Naaman Cordova-Muenzberg. 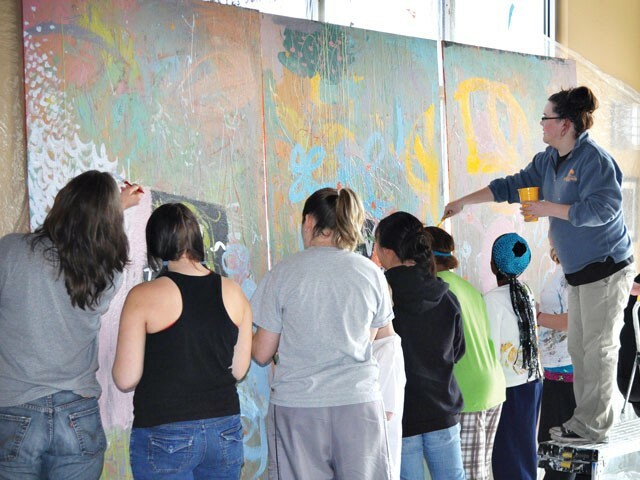 The Music City Building, 1011 W. First Ave. | Muralist Tiffany Patterson is working with a group of kids to construct a massive, multi-layered painting, symbolizing how every positive interaction between child and mentor creates the platform for a brighter future. “It’s kind of saying that every little brushstroke is important,” says Patterson. Little Red School House, 621 W. Sprague | Visual artists Cori McWilliams and Dani Pavlic are working with Community-Minded Television to capture X’s and O’s in the environment, people and architecture. They’ve edited the footage into a nine-channel video with the composition of a tic-tac-toe game, which will be projected onto the Little Red School House’s downtown windows. “We just wanted to capture all these different elements of x’s and o’s, so as people are walking by, they can say, ‘Oh, that’s in my community!’” says Pavlic. New Madison Apartments, 1023 W. First Ave. | A self-described “teen-eco-guerilla-art force,” also known as the Youth Sustainability Council, will be installing a garden, complete with stepping stones, plants in recycled bottles, benches and artwork. The Transcendence Projects take shape on Friday, April 2, from 5-9 pm. Visit riverspeak.net/transcendence-project or call 496-4796.